Under an extremely high magnification of 44, 818X, twice that of PHIL 10574 and 10575, this colorized scanning electron microscopic (SEM) image revealed some of the morphologic details displayed by a single Gram-negative, rod-shaped, Escherichia coli bacterium. 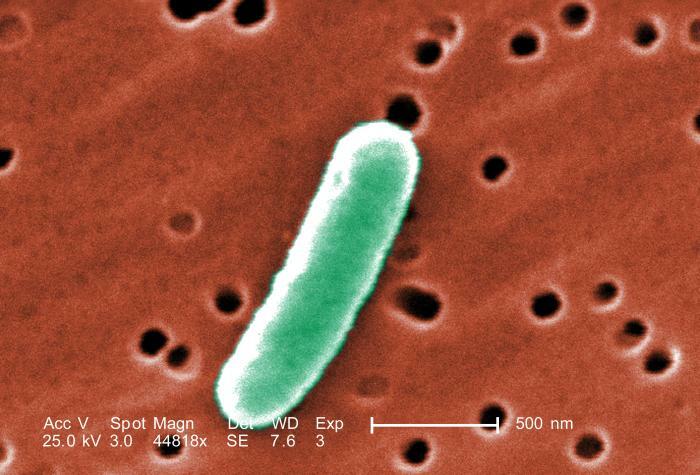 This bacterium was a member of the strain, 0:169 H41 ETEC (Enterotoxigenic E. coli). See PHIL 10576 for a black and white version of this image.